I heart oatmeal, I think is the correct expression. I may just stop writing there. 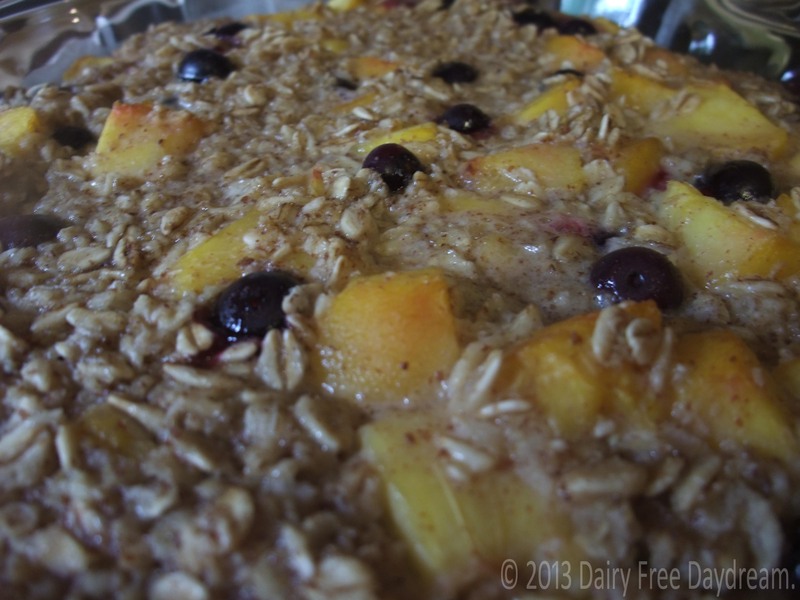 Oats are a wonderful grain and fit into breakfast, cookies, everything, etc. Groats, steel-cut, or rolled, they are amazingly fulfilling, enjoyable to eat, and fit into even the, “I just moved to New York and am sharing a closet as a room with a friend” budget. Regular oatmeal is great on its own, but lately we have been going nuts over baked oatmeal. 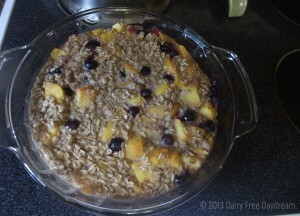 We have had baked oatmeal nearly every day while fine tuning this one. Even my four-year old, who had forgotten that he liked oatmeal for two years, has been lining up for this. Truly, this is not a hard sell. I have seen recipes for baked oatmeal that call for eggs. Now, I eat eggs, but usually not in my oatmeal. I do, however, love flax seed in my oatmeal. And since I regularly use flax seed in place of egg, this was the easiest decision I made all day. With the flax seed, the more ground the better, if you have flax flour, awesome; we have a Baby Bullet from when we were making baby food for our youngest, and this works great. If you do want to do the eggs, this converts over as 2 eggs in place of the flax seed and water. I swear I am trying to space out the blueberry recipes, but when they are in season, pretty much goes in everything for a while. To balance that out, we’ll have two versions of this. The other top contender in this area has been Apple Cranberry Walnut. There’s raisins in there too, but you have to stop the name somewhere, right? Both of these go quick, so be prepared for that. Recipes as they stand are roughly 2.5 servings. I am sure in some homes this is actually 3 servings, but for us, 2.5 is already stretching it. · In a large mixing bowl, combine ground flax seed and water, set aside. · If you are using frozen blueberries, place in a small colander and rinse thoroughly. 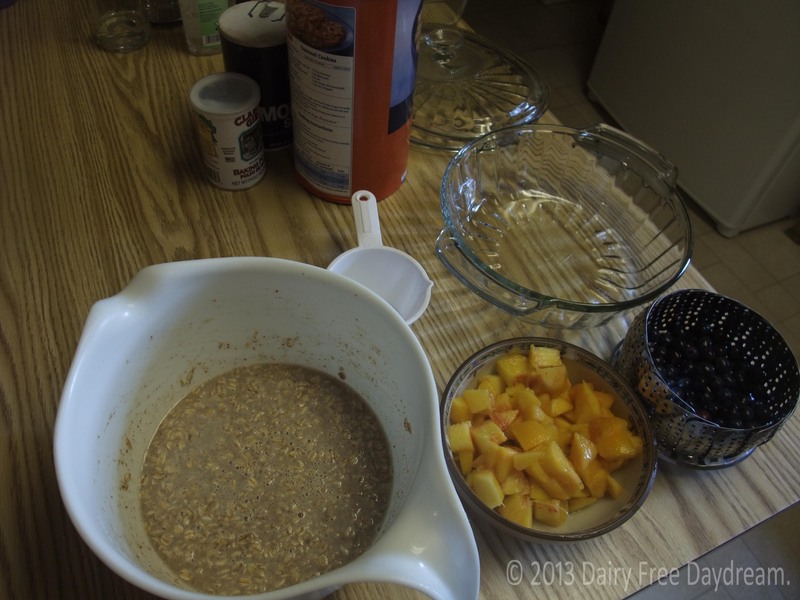 · In the large mixing bowl, add cinnamon, baking powder, brown sugar, and salt. Whisk these together. 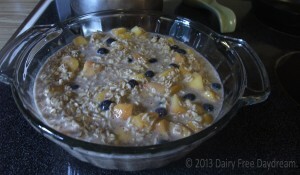 · Mix in oats and rice milk. 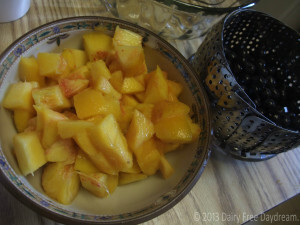 · If you are using frozen blueberries, rinse again. 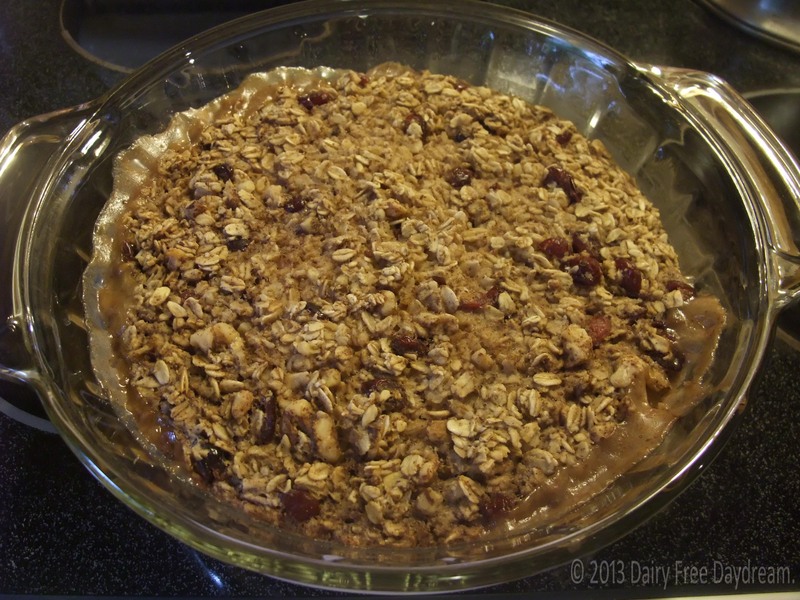 · Cut up apple, put in oven safe 2 QT dish and put in oven while preheating. 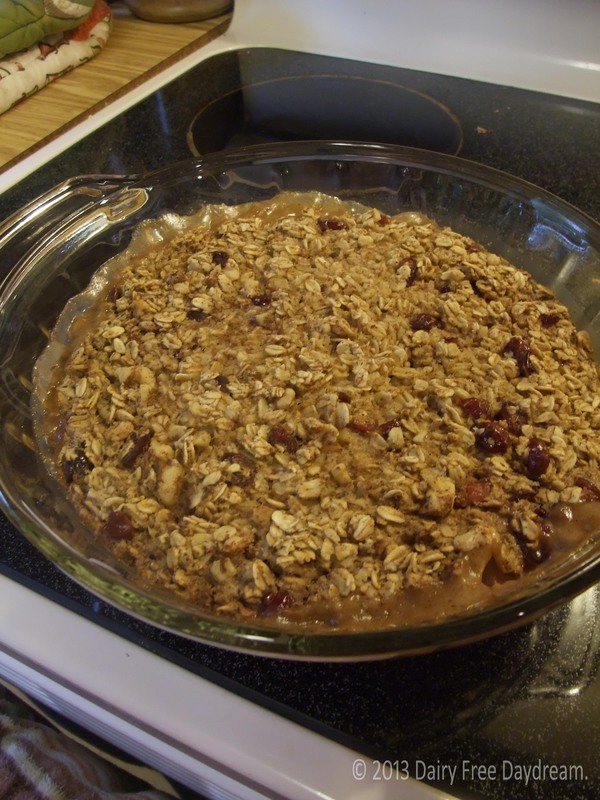 · Fold in the walnut, cranberries and raisins. · Carefully remove dish from oven. 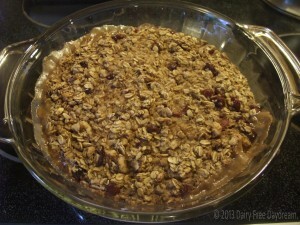 Pour remaining ingredients into oven-safe 2 QT dish.